Source: CICH graphic created using data adapted from Statistics Canada. Table 206-001 – Market income, government transfers, total income, income tax and after-tax income, by economic family type, Canada, provinces and selected census metropolitan areas (CMAs), annual. http://www5.statcan.gc.ca/cansim/a26?lang=eng&retrLang=eng&id=2060011&&pattern=&stByVal=1&p1=1&p2=31&tabMode=dataTable&csid= – accessed July 10, 2017. 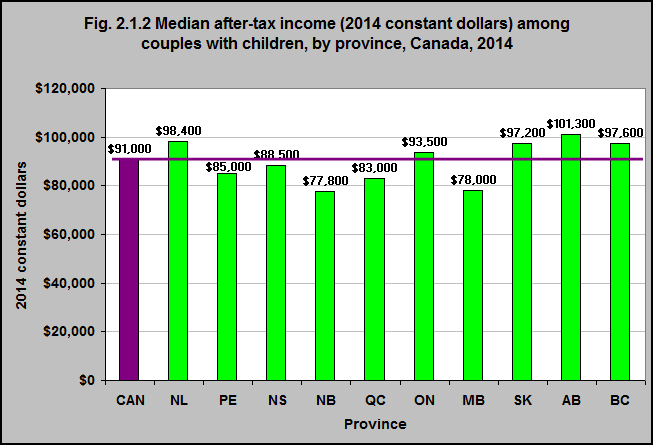 Median after-tax income* among couples with children varies among provinces. In Alberta, in 2014 the after-tax income among couples with children was $101,300. That number was approximately $78,000 in Manitoba and New Brunswick.